C. Jane Kendrick: Do The Amish Celebrate Easter? Do The Amish Celebrate Easter? People are always asking me what my sister Stephanie is like in real life. Does she really love being a mom? Is she going to have more children? Is she really that in love with her husband? Does she ever have hard days? Does she cook like that every night? To all I respond "Yes." Today I was making the earnestly cared for Amish Friendship bread from the starter that my somewhat Amish friend ~J gave me. Stephanie was over using Chup's manly sewing machine on her way to recovering Lucy's retro stuffed chairs...you know a simple way to spend one's afternoon. "Crap!" I said looking in my whirring lazy susan of baking needs cupboard. "I am out of muffin cups...except these ones from Easters." Steph stopped sowing to look up and see my predicament. "Oh well." I said and started pouring the goopy goodness in each cup. "I wouldn't use Easter baking cups." stated Steph shaking her head. "But the oven is hot, the dough is ready..."
"I know, I would wait until I could go to the store and get other cups." she said and resumed sowing. I shrugged and carried on. "I don't necessarily like that about myself, but that is what I'd do." Her voice was a bit apologetic. Then she went on to cover Lucy's chairs. They looked above and beyond amazing. I wish I had pictures of them, but please believe me when I say that they are better then Anthropologie. Which, as you know, is Kolob. All the while she cared for her constipated baby, too. Later when my muffins were out of the oven and still hot I shared them with her, cause that's what you do with Amish friendship bread. Even though they were clearly cooked with Easter emblems, she ate my offering. 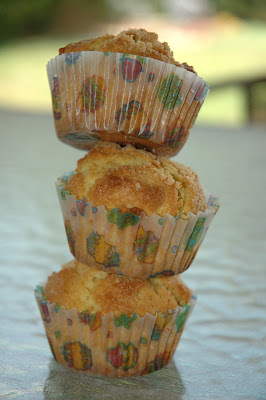 Would you've used the Easter muffin cups or held out for better? And happy Friday the 13th, you naughty werewolf you.